The Indian Under-19 team has been announced for the Asia Cup to be played in November. The team's command is given in the hands of Haryana's all-rounder Himanshu Rana. Abhishek Sharma has been appointed vice-captain of the team. This time the fourth edition of the Under-19 Asia Cup in Malaysia will be organized. The tournament will be organized from 9th to 20th of November 2017. 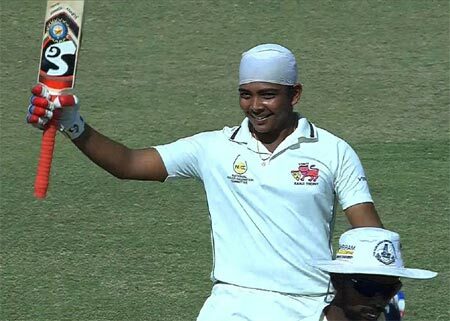 Prithvi Shaw, who has been performing well for the last few days, has not been given a place in the team.he had made a century in his debut match in the Duleep Trophy and became the youngest player to score in this tournament. He broke the record of Sachin Tendulkar. Playing for India Red, Shaw played magnificent innings of 154 runs. However, selectors on their selection in the team say that He just played in the Ranji Trophy. In the Ranji match in the beginning of this year, Mumbai had attracted everybody's attention by putting a hundred in their debut match against Tamil Nadu. Once again in the next few months, the Under-19 World Cup is played in New Zealand. In such a situation, the Asia Cup is very important for every player because they will be replaced in the team on the basis of their performance, while team coach Rahul Dravid is also looking after the World Cup. Although the team's command is in the hands of Himanshu Rana, who is quite experienced, at the same time his form is also fantastic.